Yesterday, the New York Times ran a piece by James Franco called, 'The Meanings of the Selfie,' which explored the nature of the "celebrity selfie," as well as selfies being a new tool of communication in this crazy new information age. Despite his adjunct faculty approach to explaining the celebrity selfie, this whole idea of him turning the camera (cell phone camera?) on himself isn't new though—it's sort of his MO. Through the years, we have watched (possibly because it's so hard to look away from) James Franco explore being a celebrity through different media, almost a Marshall McLuhan-inspired approach to a type of lifestyle. 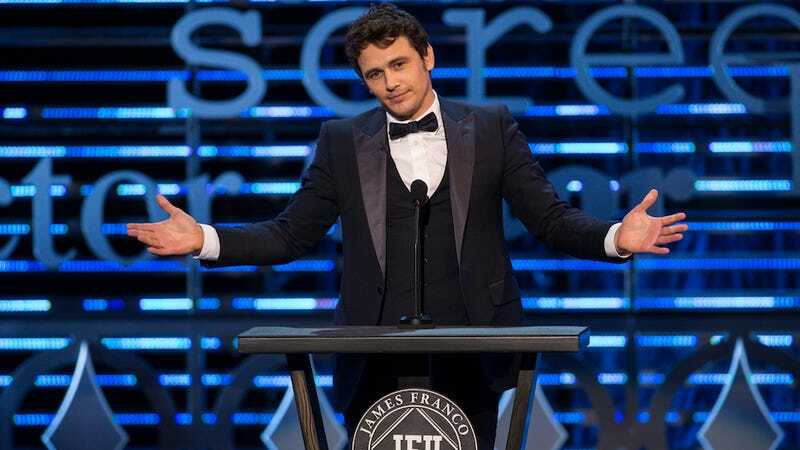 From the soap opera to the book to the performance art piece to the Comedy Central Roast, it seems no matter what the medium is, the message is always the same: James Franco is a famous person who sometimes questions reality. And that's about it. During his short stint on General Hospital, he created and played the character "Franco," a serial-killing artist who aims to enlighten people to the illusion of reality, presumably as an artistic endeavor. Literally Franco playing Franco. Clearly the part was not meant to serve people who actually watch soap operas because Franco used his time with General Hospital to film a documentary entitled 'Francophrenia or Don't Kill Me, I Know Where The Baby Is.' The film-thingie, which was screened at the Tribeca Film Festival, was supposed to follow an actor playing a role of the same name, blurring the lines of reality. Franco on Franco…on Franco. It's the perfect example of how James Franco comes off like he's supposed to be as mind-blowing as that one time you got high and looked at a gif of a tesseract for hours. But really, he's more like that other time you got high and made out with your recently-atheist classmate while Donnie Darko played in the background. Franco has always been incredibly meta-self-reflective, which is part of his appeal. He is his own subject and—spoiler alert—his own object, whether he's hilariously poking fun at himself (Gucci by Gucci), spelunking the cavernous depths of multiple hyper-realities, or just filling up his Instagram with selfies. He certainly gives us an interesting and fairly transparent glimpse into the life of a celebrity, but just because he uses every possible medium to explore that same thing over and over again doesn't bring any particularly new meaning to the idea of a celebrity. "We speak of the celebrity selfie, which is its own special thing. It has value regardless of the photo's quality, because it is ostensibly an intimate shot of someone whom the public is curious about…And the celebrity selfie is not only a private portrait of a star, but one also usually composed and taken by said star — a double whammy." "We all have different reasons for posting them, but, in the end, selfies are avatars: Mini-Me's that we send out to give others a sense of who we are." Just like his selfies, Franco's more intensely self-reflective work, regardless of its quality, provides the audience a glimpse of insight into who he is while allowing himself to explore who he is too. Something that has value because it's "ostensibly" incredibly meta. Yep. James Franco is the celebrity selfie personified.